Oil Off The Coast Of Ibiza? Protesters Don't Want To Know : Parallels Spain is weighing a plan to allow oil exploration near the party island of Ibiza. Opponents fear the move could threaten the environment and tourism, but finding oil could also be an economic boost. Ibiza — famous for wild, all-night parties — is home to some of the Mediterranean's most pristine beaches and thriving marine ecosystems. But these could soon be endangered by more than the island's hedonism. Spain's central government is considering whether to allow oil prospecting near the coasts of Ibiza and its neighboring island, Formentera. The proposed survey area is about 1,500 square miles and starts around 30 miles off the coastline. Leading the push for exploration is the Scottish oil and gas company Cairn Energy, which is currently awaiting approval from Ibiza's Ministry of Industry on its environmental impact assessment. A decision is due by September and, if approved, the company could start looking for oil over the winter and perform the first exploratory drill as early as next year. Oil exploration might be theoretical for the moment, but residents of this Balearic paradise are concerned their voices will go unheard. After all, large-scale protests and 200,000 petition signatures failed to stop similar plans in the Canary Islands, where Spanish multinational Repsol has been given the green light to carry out exploratory surveying later this year. The appeal of finding oil reserves is easy to understand given Spain's economic struggles, something Cairn has latched onto in selling the idea. "Finding a significant source of oil and gas offshore Spain would benefit businesses as well as the national economy, local communities and government of Spain," its brochures say, "providing valuable taxation revenues whilst also providing longer term national energy security." Spain is heavily reliant on energy imports, buying 99.6 percent of its oil from countries like Saudi Arabia, Nigeria and Russia. Finding reserves could relieve its dependency on foreign petroleum. There are no estimates available for Ibiza yet, but the government claims the Canary Islands alone could provide 10 percent of Spain's oil needs. Oil also brings the promise of much-needed jobs to a country that's suffering from a 26 percent unemployment rate. A report by consulting firm Deloitte concluded that a Spanish oil industry could generate 260,000 jobs by 2033 and account for 4.3 percent of the GDP by 2040. But while the central government sees oil exploration as an opportunity, the islanders see it as a threat to their livelihoods. In fact, opposition to Cairn's intentions has managed to bring together the island's social sectors — from politicians and business leaders to environmentalists — in an unprecedented way. Local socialist and green parties have joined forces to protest with members of the conservative Partido Popular (PP) who, despite belonging to the ruling government party, are fighting the plan. "Our wealth is linked to the tourism industry, so we have to pay special attention to it," explains Miquel Jerez, member of the PP in Ibiza. "We also need to protect our environment, which is our main attraction." 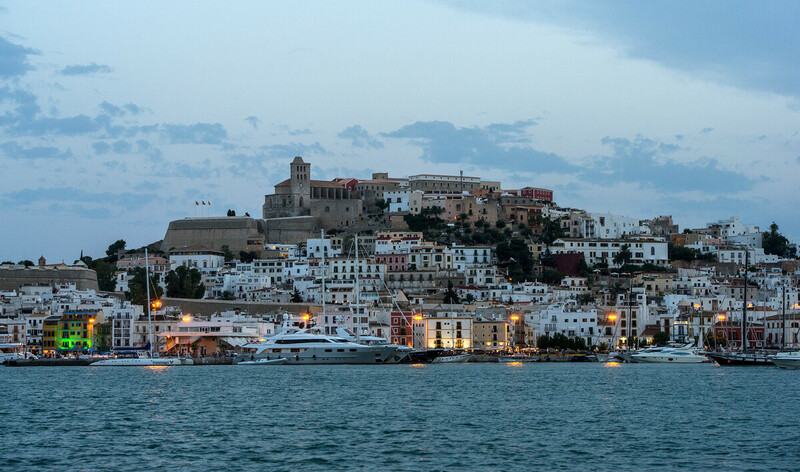 Ibiza is a UNESCO World Heritage Site, and tourism is indeed its main source of revenue. Together with Formentera, the islands receive about 2.5 million tourists a year, so restaurateurs and hoteliers now worry that having oil rigs offshore will damage the islands' appeal. Even famous visitors like Fatboy Slim and Kate Moss have spoken out against the prospecting. "Ibiza is in danger. It's not a myth, not a metaphor & not an exaggeration," Paris Hilton posted on Instagram. For once, the islands' environmentally conscious folks agree with the jet setters. Some reactions might be disproportionate, given that nobody yet knows whether there's oil there, but ecologists say even the exploration could damage the marine ecosystem. Cairn plans to conduct controlled explosions for mapping the bottom of the sea, using underwater air guns that fire high-pressure air "bubbles" that produce a sound penetrating up to 20,000 feet into the ocean floor. The reflected acoustic waves provide details of rock formations below the seabed. Greenpeace says these sonic shocks — up to 250 decibels and similar to a dynamite explosion — could disturb endangered species like bluefin tuna and affect the hearing ability of rare cetaceans like striped dolphins. "Either we do something, or this situation could be catastrophic," says Julio Barea, Greenpeace's energy campaign manager. 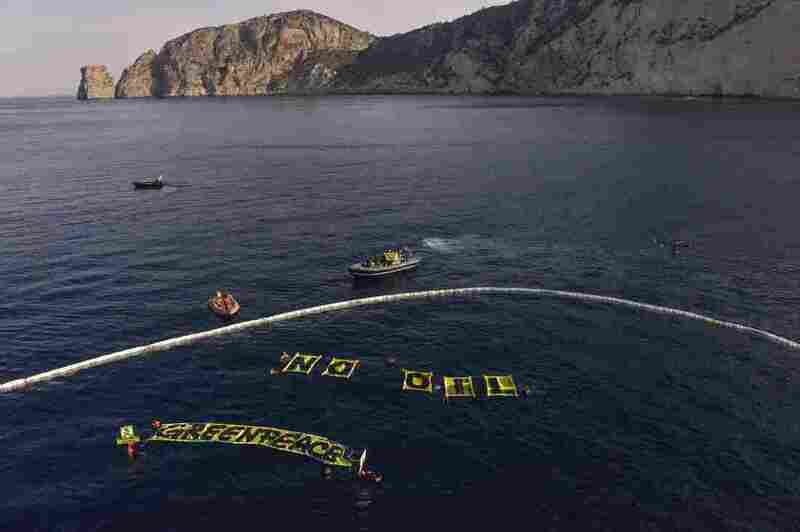 Greenpeace environmental activists protest oil exploration in the waters near the Spanish island of Ibiza on June 11. Meanwhile, local fishermen fear that seismic exploration will reduce their catches. "This will be the victory of a few and the ruin of the rest of us," says David Sanchez, a fisherman from Formentera. "We are all very scared that the explosions will either hurt the fish already here or scare away the migratory species, like tuna." These fears may not be unfounded. Norwegian fishermen, who have long coexisted with the offshore oil industry, claim they catch 50 percent fewer fish when a vessel is carrying out seismic surveys nearby. Cairn says it will try to gather its data in the winter, when "any impact will be at a minimum," and insists the process is in "the very early stages." But ecologists argue that now is the time to stop because if oil is discovered, there will be no turning back. Greenpeace also warns that Cairn hopes to explore down to 5,000 feet, which means that the platforms would be operating at a depth similar to BP's Deepwater Horizon when the 2010 oil spill occurred. While islanders await the government's verdict on whether their Mediterranean mecca may become an oil producer, conservationists are already planning their next move, which could be filing a complaint with the European Commission or the European Parliament's Committee on Petitions. "If the government submits a positive [environmental impact] report, we'll have the opportunity to go to the European Commission and file a complaint for infringement of the European environmental directives," says Barea. The pros and cons have been laid out, and Spain finds itself at a difficult crossroads. Oil drilling could deliver a much-needed boost to its troubled economy, but it risks damaging the country's natural heritage and hurting its long-established economic engine: beach-based, party-filled tourism.